Do you ever feel like your heart misses a beat? There’s a good chance that what you noticed was a heartbeat that happened sooner than it usually does. When that happens, and then follows up with a fluttery or skipped beat, it could be a premature atrial contraction (PAC). You might also hear it called atrial ectopic beats or atrial premature beats. They’re common, and most of the time, they don’t need treatment. Your heart has four chambers. The upper two are the “atria.” If your heart’s electrical system triggers the early or extra beat in the atria, the result is a premature atrial contraction. A similar condition -- premature ventricular contraction (PVC) -- starts in the lower chambers, called “ventricles,” of your heart. Any time your heart shifts out of its usual rhythm, doctors call it an “arrhythmia.” There are lots of different kinds, including PACs. Usually, premature atrial contractions have no clear cause and no health risks. 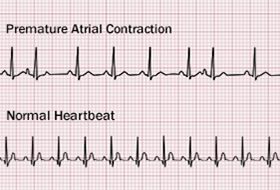 In most cases, premature atrial contractions aren’t a sign of heart disease and just happen naturally. If your doctor finds that you have a condition related to the premature heartbeats, you’ll work together to make a treatment plan. When you have single or occasional PACs, there’s usually no need to seek medical treatment. Electrocardiogram, or EKG . This test will show if you have arrhythmia. Holter monitor. This is a portable version of an EKG that you’ll wear for 1 or 2 days. It tracks all the electric activity of your heart for your doctor to study. Exercise stress test . This test has you attached to an EKG while doing physical activity like running or walking on a treadmill or riding a stationary bike. Echocardiogram. This test uses sound waves to measure how well your heart valves and muscles work. If your test results show that you have other heart-related problems, your doctor will recommend a treatment plan for you. Most of the time, though, PACs don’t need treatment. Lifestyle changes. Lower stress, stop smoking, cut back on caffeine, and treat other health issues like sleep apnea and high blood pressure. Medicines for arrhythmia. Take medications that are used to cut down on or end premature heartbeats. American Heart Association: "Premature Contractions -- PACs and PVCs." National Heart, Blood, and Lung Institute: "Types of Arrhythmia." University of Wisconsin Hospital: "Premature Ventricular Contractions, PVCs; Premature Atrial Contractions, PACs." Allina Health System: "Premature Atrial Contractions." The Ohio State University Wexner Medical Center: "Premature Heartbeats."